When brush-maker A.P. Pedersen founded what is now known as Vikan – way back in 1898 – the name was Skive Børstefabrik (Danish for “Skive Brush Factory”, named after the town of Skive, which was – and still is – a small town in the heart of farming country in mainland Denmark). Back then, things like brand names and trademarks were of no importance in the world of business. It was more important that people knew what to expect from the manufacturer and from the shop they were passing, as was the case here. During the 1920s, A.P. Pedersen’s brush manufacturing business was booming and sales to other parts of Denmark were growing. A.P. Pedersen purchased a patent from a man who had invented a scrubbing brush featuring a special iron fitting that could be turned round. This meant that when the bristles on one side of the brush were worn and the scrubbing effect was getting a bit lop-sided, you could then simply turn it around and start using the bristles on the other side. To support his patent, the man had made a sticker that he attached to the handle of the scrubber, with a drawing of a cleaning lady and a scrubbing brush along with the words Vi kan (Danish for “we can”). The basic message was that the right combination of manual effort and the right cleaning tool together give you the best results. A thrifty man, brush manufacturer A.P. Pedersen simply used the rest of these stickers, and that’s how the name Vikan was first introduced. Over the following years, however, the Vikan name was more or less forgotten again, and the company’s brushes were again sold bearing the name of the factory – Skive Børstefabrik. After the Second World War, A.P. Pedersen’s two sons, Gunnar and Carl Wilhelm Pedersen, who had taken over the brush factory, started exporting brushes to the UK, Finland and Germany. But this meant they ran into problems with the very Danish name – Skive Børstefabrik – which no non-Danes could make sense of, let alone write or pronounce. They therefore needed a proper brand name rather than just using the name of the factory. To meet this need, the Vikan name was slowly re-introduced and added to more and more brushes as they left the factory. But the actual company name was still Skive Børstefabrik. As a result, more and more customers came to know the company’s brushes as Vikan brushes, and when Skive Børstefabrik moved into its new factory in 1956, the Vikan name took pride of place on the gable of the building. But even after this, the official name of the company remained as “Vikan A/S – Skive Børstefabrik”, and this was not formally altered until 1997. Even to this day, the locals in Skive still call Vikan børstefabrikken – the brush factory. 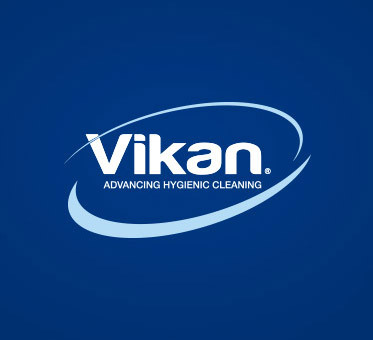 The original idea behind the Vikan name – about the right combination of manual effort and the right cleaning tool – is actually something that the company has adhered to for many, many years. We still believe that the appropriate combination of the best cleaning implements with the right amount of human effort and dexterity (with suitable doses of time and chemicals added into the equation) provide the best, safest and most effective cleaning results. Our manufacturing capabilities and our distinctive expertise within the specialist field of hygienic cleaning tools bear eloquent witness to these proud historical origins.